Earlier this week approximately 40 music students from S1-6 entertained parents, family members, teachers and classmates with a variety of musical performances. The audience received a glass of sparkling fruit juice on arrival and discovered the assembly hall was staged to resemble a music lounge creating a relaxed atmosphere. Included in the ticket price were nibbles which the audience could help themselves to during the evening as well as tea, coffee and tray bakes which were served by prefects and the Geography department during the interval. 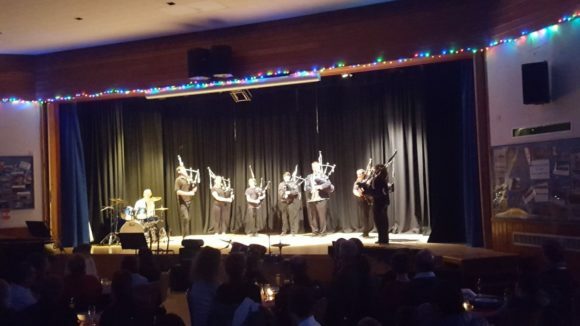 After a quick introduction from the Acting PT of Music, Mr Nairn, the first performance was provided by our Piping group led by piping instructor Mrs McBain. This was a fantastic demonstration of the hard work that is put in by both staff and pupils and was an early indication of the array of talent the audience were about to hear. The next two musical items were public firsts from our Higher students Rehana Karim and Jamie Buchan, who delivered a calm and technical performance on their piano and guitar instruments. The evening continued with our string group led by string instructor Mr Hay. The group performed three pieces one of which (Harry Potter Theme) was a crowd pleaser with our younger audience. This was followed on with a strong clarinet solo by S4 student Anna. The first half of the evening was then rounded off with a set of Scottish pieces performed by Lewis MacRae on solo bagpipes. The second half of the evening was introduced by the Woodwind group led by woodwind instructor Mrs Aalders. The group performed Dixieland blues and an arrangement of Disney’s Beauty and the Beast, both to a very high standard and were greatly received by all. As the group left, two flautists (Beth Crookes and Grace Cranidge) remained on stage to perform a duet called Somewhere Out There. Our next musical acts were a piano duet Kern Robertson and Charlotte Stewart. Kern had already been on stage that night performing with the String group and had rushed back from an ABRSM theory exam to attend the concert. True dedication. Our next two soloists were from the Higher and Advanced Higher class. Cal Roche performed Headlands on his fiddle and S6 pupil Nathan Bell performed Eat My Ferrari on the bass guitar. Nathan went on to stun the audience further with an improvisation. Our final act was the much anticipated Percussion Group led by percussion instructor Mr Galbraith. This year they performed the theme tune from Super Mario brothers. A big thank you to our S5 Advanced Higher pupil Patrick Morris who provided rhythm support on the drum kit for three of the instrumental groups. Our lighting and sound support were provided by our S3 BGE Music Technology pupils who did an amazing job creating the atmosphere. Special thanks should also be given to Mr Fairfield who accompanied and rehearsed the instrumental groups and soloists.